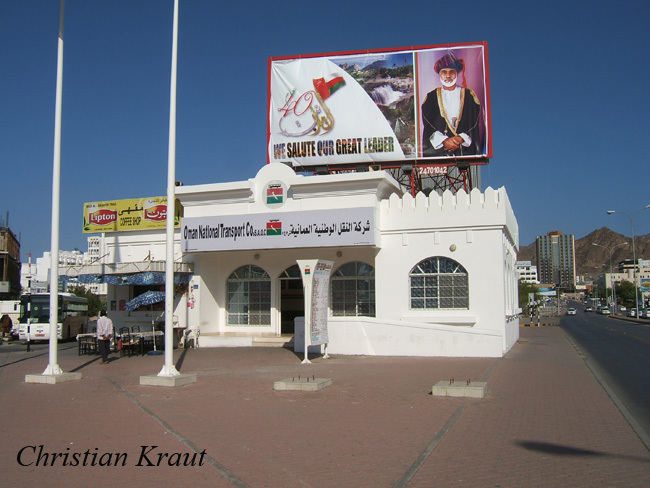 ONTC was responsible for public transport in Oman, including urban services in Muscat and regional and long distance services, also to neighboring countries. It was formed by Royal Decree and started operations in September 1975. Initially the fleet consisted mainly of Dodge US-school bus types but in 1982 most of the fleet was renewed. Around 1985 the fleet consisted of 241 vehicles (51 Hino, 40 MAN, 59 Mercedes-Otomarsan, 31 Mitsubishi, 7 Toyota, 23 Nissan, 7 TATA, 17 Landrovers and 6 others). Newly delivered then were 24 Mercedes -Jonckheere of around 9 meters and 6 high-specification MAN and Hino coaches (Janes Urban Transport Systems 1987). Around 1995 the fleet consisted of 289 vehicles (53 Hino BY620/RU638/RJ170, 44 MAN 16.240/12.170/14.170/16.280, 58 Mercedes 1417/O302/1217, 5 Daewoo BH115, 22 Mitsubishi Rosa/MK, 34 Toyota Coaster, 40 Nissan Civillian, 6 TATA of 1984, 27 Landcruiser/Landrover (Janes Urban Transport Systems 1997/1998)). Corporate livery is white with green and red (the national colours). Towards the end of the company the buses were mainly white with green and red stripes. In October 2015, together with a fleet renewal, ONTC was rebranded as Mwasalat. Some of the newer series of ONTC buses continued under the Mwasalat banner. 25-16 to 25-17: Daewoo BS090 wheelc.